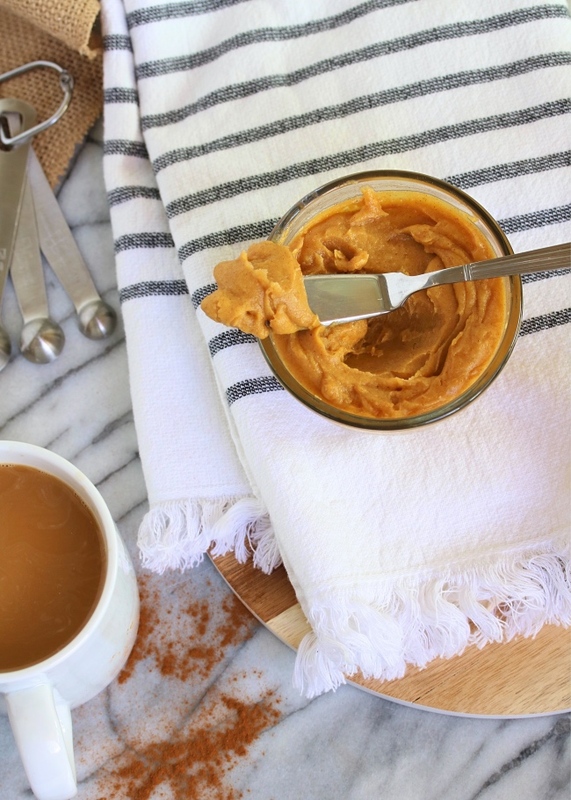 Just in time for the full swing of fall festivities, I've got a pumpkin spice recipe for you that will fill you up with healthy fats AND give you all of those PSL vibes! I'm a sucker for a Starbucks' pumpkin spice latte- but as soon as I get a glimpse of the color and think twice about the after taste, I usually second guess my decision and wonder just how "worth it" it is to splurge on one. I typically go decaf (pregnancy) and opt for coconut milk with no whipped cream. But in the back of my mind I know there's a long list of other things in those delicious lattes that aren't doing my body any good. 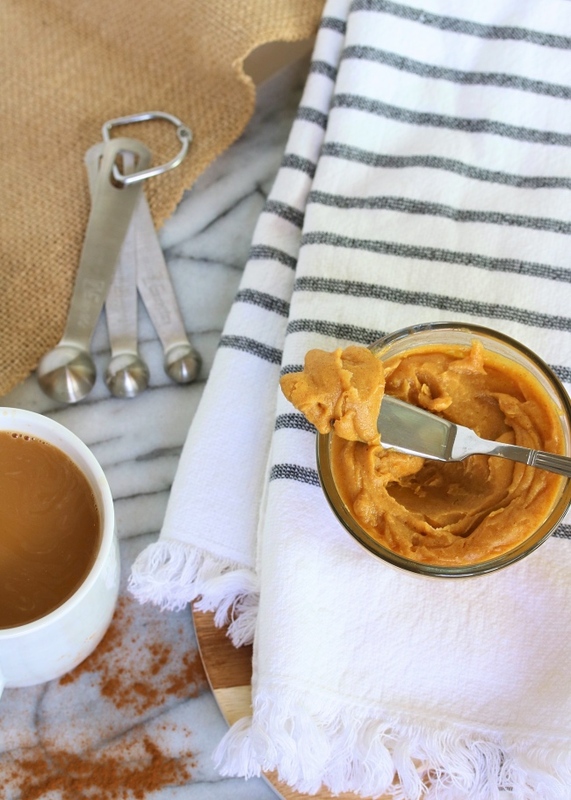 So I took an idea I've been working on for awhile now: COFFEE BUTTER... and I decided to hit you with a fall version first! A little pumpkin puree and some pumpkin pie spice, plus a dash of maple syrup, and you've got yourself a pumpkin spice flavored coffee that loves you back! 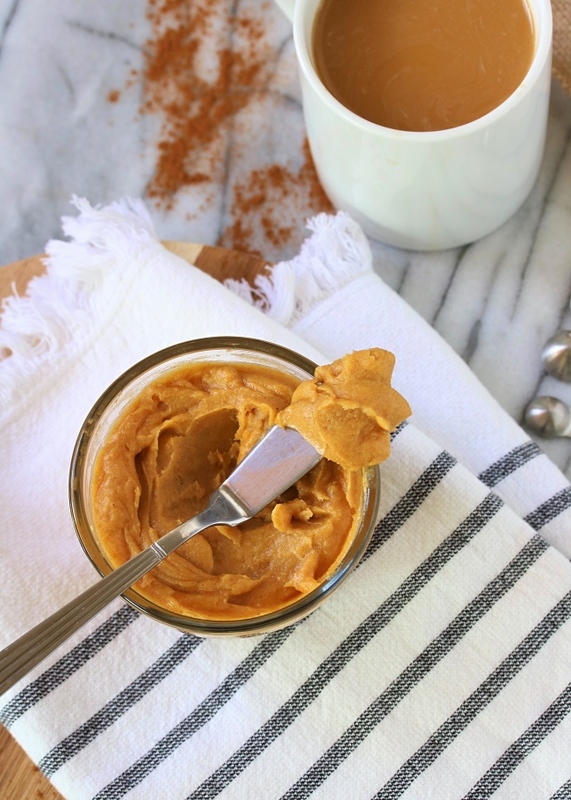 This coffee mix-in is loaded with healthy fats from grass fed ghee, coconut oil, and coconut butter- and it makes your coffee rich & creamy in the most delicious way! 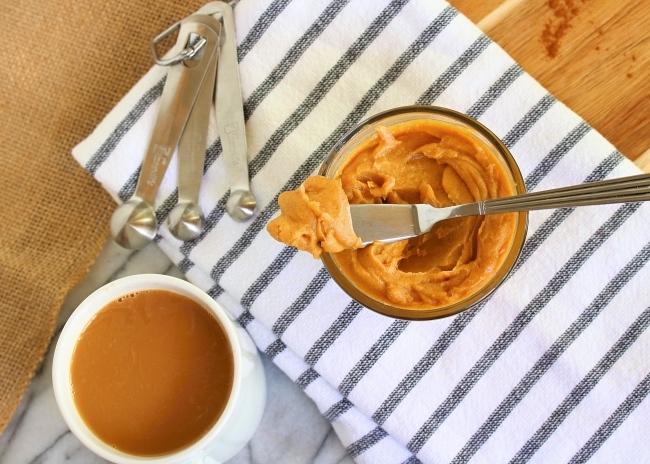 I typically add a splash of coconut milk to my coffee, then a scoop of this coffee butter (about a tablespoon), and froth with my handy dandy hand frother that I get on Amazon HERE. The result is a bulletproof pumpkin spice latte that keeps me full and tastes delicious- without any scary ingredients! I hope you love this, and stay tuned for more flavors to come! 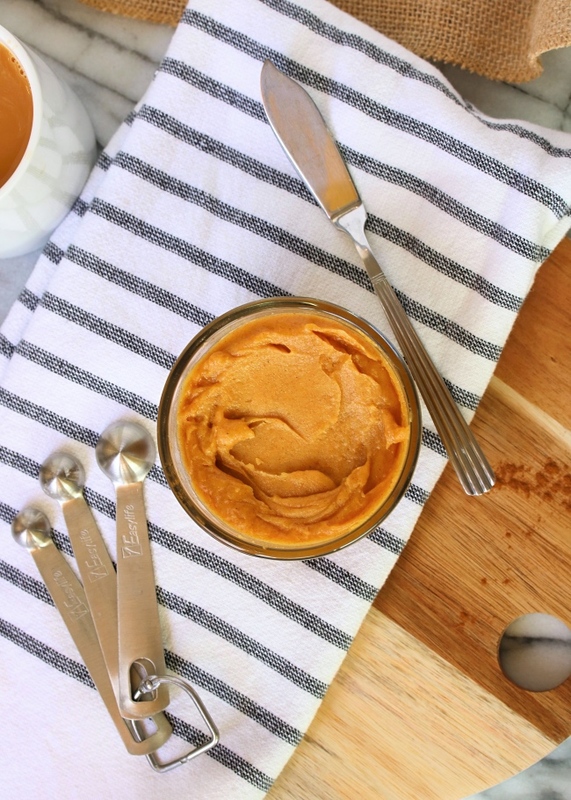 Soften the ghee and coconut oil in the microwave or over the stovetop, then add to a blender. Add the remaining ingredients, and blend until super smooth. 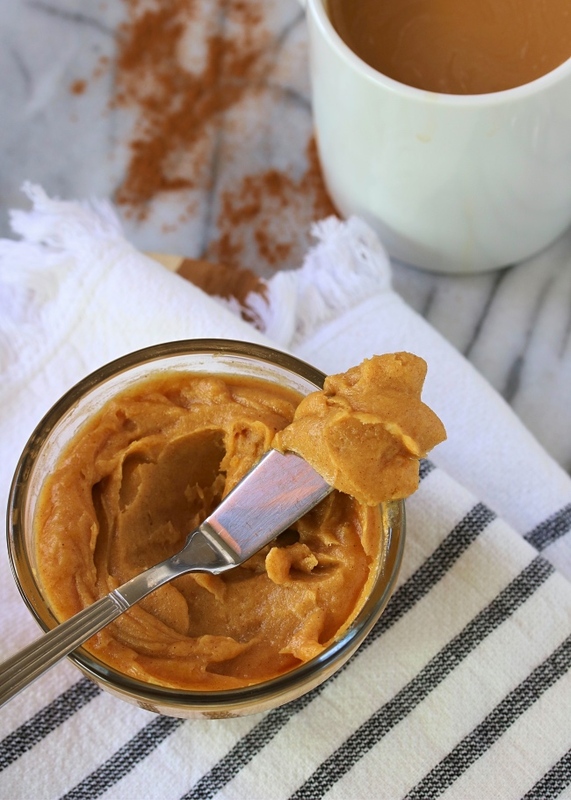 Transfer to a airtight container (a mason jar or lidded bowl works well) and allow the coffee butter to cool. Store in the refrigerator for up to 2 weeks, and add a scoop to hot coffee as needed. Feel free to omit the maple syrup if you'd like an unsweetened version! I do find a little goes a long way, but it's not necessary. This recipe is Whole30 compliant without it! This looks and sounds so amazing and I can not wait to make this. Thanks for all your hard work that you do for all of us. I made this last night before I went to bed so it would be ready in the morning. My goodness is it so dang good! Thanks for the recipe! You are so welcome Jackiei!!! And Cheryl- yay! I'm so glad you made it & enjoyed. Makes me so happy!